I have been baking bread for over a quarter century, so it always comes as a bit of a surprise when people talk about how difficult it is (though it shouldn’t surprise me by now). There is a mystique to baking bread, and yet it is one of the most basic and essential foods. And it is easy! Well, it is easy in the sense that anyone can do it, but it does involve a little labor and time. My guess is that most bread ‘failures’ come from trying to rush the process or from following an overly complicated recipe — the kind of thing to try when you have gotten the hang of the basic process of baking bread, not when you are just starting out. Here is my most basic recipe. Take water, flour, yeast, and salt, mix it together to form bread dough, knead it, let it rise, bake. What could be simpler? Of course, it does help to know some proportions, but as you’ll see they can be quite flexible. And it can help to add a few things: a little oil helps the texture, and an egg makes for somewhat a lighter loaf. Neither is absolutely necessary. Sugar helps the yeast start rising, though it isn’t really necessary either. I usually use a little molassas (for iron) or honey, rather than sugar. Milk, often called for in recipes, also helps the texture, but can cause problems, so I usually leave it out. Enzymes or bacteria in milk kill the yeast unless the milk has been heated to over 100 degrees. Heat also kills yeast, so putting yeast in milk that is too hot will also kill it. One solution is to use powdered milk. It has the same effect and doesn’t need to be heated. But I don’t keep that on hand, so I rarely use it. I wonder about today’s super-pasturized milks and whether they might be safe. But I haven’t experimented with them yet. I’ve been baking bread at least once a week for about as long as I can remember, and I’ve made nearly every mistake in the book and never made bread that was inedible (to me). So, if you give up on the notion of ‘perfect bread’ and learn to live with and even enjoy the bread that comes out of the oven for what it is, you will learn from your mistakes and eventually reach a level of consistency. But even then you’ll have the occasional mishap, like the times the oven has been turned on while the bread dough was rising, making it potentially too hot for the yeast to survive — I’ve rescued a few batches like this, sometimes adding more yeast after cooling if necessary. But usually bread is resilient enough once it’s in a dough that it will bake up reasonably well regardless. The only times I haven’t baked bread have been when I’m traveling and when I’ve lived in Belgium, where I didn’t have an oven (only a stove-top to cook on in a tiny apartment) and where there is a good bakery around nearly every corner. I don’t believe in bread machines for two reasons: one, the word machine in the title scares me, and two, I would miss the process of making bread if I left it to a contraption. There is something inherently satisfying in making your own staples and being close to food that sustains you. That is why I don’t mind the fact that bread takes work. I try to approach it more like a ritual than a chore. First you take water. I like to start with cold water straight from the tap (not refrigerated but also not warm, which many recipes call for). Warm water speeds up the process, but if it’s too warm you kill the yeast and ruin the bread, so take your time and start with cool water. Another advantage at our house is that our cold water is filtered, so it has less chlorine. Add good powdered yeast. Keep it in the refrigerator to keep yeast fresher longer. A couple of tablespoons usually will be enough. Too much, and the bread will rise too fast. Too little, and it takes a little longer. Better to err on the side of too little until you get used to it. Add a little molassas, honey, or sugar to help the yeast ‘proof.’ You can let this sit for 5 minutes, if you like (I usually don’t) to let the yeast dissolve and start to grow. Next mix up a sponge. Add flour to the mixture a handful at a time, stirring as you do. You want the mixture to get thick like mud but still be able to be stirred. I stir with a wooden spoon. Stir at least 200 times. This is one place where there is some work involved, but it is important to stretch the dough. If you don’t want to do this by hand and you have a good stand mixer, turn it on with a bread hook, and it will stir the dough for you. You want to act like you are the bread hook, if you’re doing this by hand. Stir it so air gets in the dough (to help the yeast grow) and so the dough stretches. You are forming gluten, the stretchy stuff that makes bread rise the way it does. The more you work it now, the less you’ll have to kneed it later. Let the sponge sit, preferably in a warm (but not too hot–100 degrees is about the limit of heat) place for about 20 minutes or more. Cover the bowl with a wet cloth, so the sponge won’t dry out. You’ll see bubbles when you check it (these also help form the gluten–you’re letting the yeast do some of the work for you). Now it’s time to make the dough. Add a couple teaspoons of salt, a tablespoon or two of oil. You can also add an egg, nuts, oatmeal, or anything else you want to mix in the bread at this point). Begin adding more flour a handful at a time, stirring as you go. As you stir and the dough thickens up, you will start to push the ball of dough around the bowl instead of cutting through it. You’ll notice I haven’t said what kind of flour to use. Bread flour is nice (it has high gluten), but all purpose flour will work fine, too. 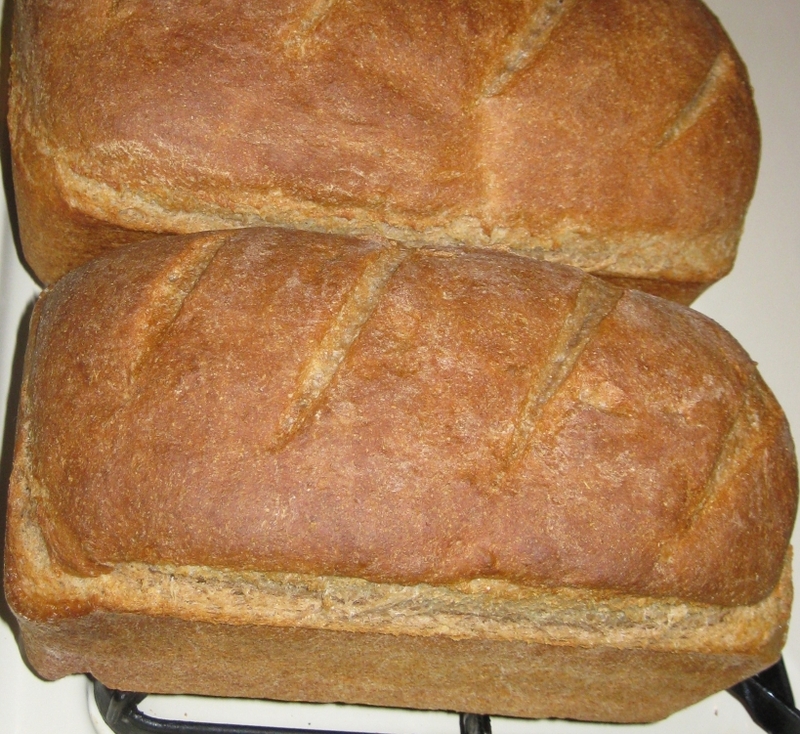 I prefer organic flour, and usually mix white and whole wheat to get the texture I like. Rye and other specialty flours can be added. I also haven’t said how much flour to use. Make sure you have plenty on hand. You’ll know when it’s enough when the bread has the consistency of dough. After awhile, it will become difficult to push the ball of dough around the bowl with the spoon. (A bread hook can be used up to this point, if your mixer is powerful enough.) Clean the spoon by dusting it with more flour and scraping the dough off with your hands. Start kneading in the bowl by pushing the dough around the bowl with your hands. As this gets difficult or as you use up most of the flour in the bowl, roll the ball of dough out onto a floured surface and continue kneading by hand. To knead, use the palm of your hand to push the bread down onto the surface, flattening and stretching it, then rolling it back up. The dough will collect the flour. If it is sticky, add more flour. When it no longer sticks to the surface, continue kneading without adding flour. Kneading the dough takes some getting used to. You’ll get the feel for it after awhile, and it is a quite enjoyable experience. Put your weight into it, and it’s not that much work, especially if you don’t overdo it on the flour. A lighter dough can be a bit stickier but is easier to handle in the long run. I tend to make a pretty hearty loaf, so it takes a bit of work, but I enjoy it. Let the dough rise in the mixing bowl, covered with a wet cloth. Usually I use two risings of about an hour each, though a lot depends on the temperature of the room and the amount of yeast. Between risings, punch the bread down to get rid of the built-up carbon dioxide. This will help the yeast continue to grow. The rising time is why baking bread takes awhile, usually all morning or all afternoon, depending on when you start. I used to use a method where I started the dough the night before and let the first rise happen over night. This makes a really good loaf, and it saves some time. You can let the dough sit as long as you want (within reason) because the yeast goes dormant after awhile until the dough is punched down again. If you want your fresh bread early, you can get up in the middle of the night and punch it down a couple of hours before you want it done. Or you can just leave it all night and take a little longer in the morning. I’ve even skipped the second rise if the first rise was long enough, and the bread turned out all right. Once the ball of dough is ready, it needs to be made into loaves. Cut it in half and fold the cut end of each half over itself, so the uncut part of the bread is what is on the outside. Pinch the edges of the cut side together and put that side down. Pat (bang, hammer with your fist, don’t be shy about it) the dough into the shape you want. Do this again with the other loaf. Put it on or in the pan you want to bake it on or in. Loaf pans are great if you want a more uniform shape. I never used to use them, though, until our son had to take a lunch to school, and then the square sides fit better in a sandwich bag. A round or oval loaf works just as well. Grease a cookie sheet and sprinkle with a little corn meal or flour, then place your loaves on the sheet. Oil or grease a loaf pan, if you use those, and press the loaves of bread down so they fill the bottom of the pan. Let the loaves sit for another 20-30 minutes to let them rise. Then cut slits in the top (to let the steam escape when baking), and bake for about 35 minutes in a 425 degree oven (or 40 minutes at 400 or an hour at 350). Take out of the oven and remove from the pan. Cool, covered with a dry towel, for 15 minutes (or as long as you can wait), and enjoy. Writing it all out, I can see how it might seem complicated, but really the steps are pretty easy once you get the hang of it, and bread can be pretty forgiving if you allow yourself a few flops. As long as you don’t completely kill the yeast, it should be edible, and even if you do, it’s edible, just very chewy. I first learned to bake bread from my good friend George Ulrich. Later, Ed Brown’s aptly titled Tassajara Bread Book became my bible because of his no-nonsense approach to the whole process. After awhile, I stopped using a recipe and learned to adapt my methods to the situation. A few tricks like warming the oven in the winter help speed the process along when necessary, for instance. Otherwise, setting the dough in the oven or on top of the eye with just the pilot light burning on a gas stove (or the light on in an electric one) can help a lot. I’ve tried making sour dough or fancier recipes (we love hot crossed buns at Easter, for instance), but always gravitate back to this one basic recipe. The bread turns out a little different each time it is made, but that is because it is a growing, living thing. As you stir it and knead it, you feel it taking shape in your hands. There is a kind of meditation to the labor of making it that is soothing — and if you’re frustrated, punching down a ball of dough does no harm (unless you miss). Yet the greatest benefit to baking your own bread is the bread itself. When you eat from the first loaf fresh out of the oven and still warm, it is heavenly. And when you continue to eat off the loaves, the bread is much more filling and satisfying than store-bought bread (and less expensive). Give it a shot, and you might get hooked. I am a fellow bread baker; don’t know what I would do without bread baking in my life. My father in law taught me his recipe before he died and I’ve been making it for my family about 15 years now. French bread. I have made inedible bread, though. There was the time I left out the salt. And worse, the time I put in 3 tablespoons of dried rosemary when the recipe called for 3T of fresh. Big difference there. It was like eating dirt. Anyway, I really appreciate your painstaking description of the process and the science behind it. I feel like you have the beginnings of an essay here. How does your family feel about your bread baking? How do you feel about being the (literal) bread provider for your family? And yes, it’s funny that people think baking bread is so magical when it’s really so easy. It’s the only recipe I truly know by heart. Oh, now that you mention it, I’ve probably made inedible bread at least once. I tried using fresh garlic in the dough and it didn’t rise. I suspect the garlic killed the yeast. I probably ate it anyway, though, so my definition of inedible might not be identical to everyone’s! I have made barely edible bricks. I don’t know about the dried rosemary, though, that might be enough to make me falter. One of my favorite breads in all the world is a brick. The Danes make a rye bread that is essentially rye berries with a little flour. I don’t know if there’s any leavening in it at all, though there may be some baking soda. This is some coarse bread! And it is made in little, long square loaves (and I mean very square on all sides, which is why I suspect there’s not much leavening). It is fairly moist, though (the rye berries must be soaked, I imagine). They slice it super thin and make little open-face sandwiches. Danes usually eat their sandwiches with a knife and fork, and the toppings can be quite elaborate. As you can see, I don’t have this recipe (as far as I know, though I do own bread books that I haven’t explored fully). All I have are good memories of eating this bread. It’s hard to find in the States, though.